WilliamButlerYeats is a Legacy Library. Legacy libraries are the personal libraries of famous readers, entered by LibraryThing members from the Legacy Libraries group. » William Butler Yeats's catalog. » William Butler Yeats's legacy profile. WilliamButlerYeats is also an author. 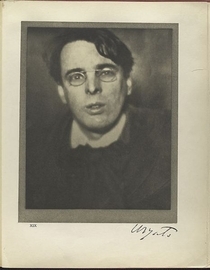 » See William Butler Yeats's author page. About meWilliam Butler Yeats (13 June 1865 - 28 January 1939), Irish poet, playwright, and statesman. About my libraryYeats' library is currently housed at the National Library of Ireland, along with the rest of his papers. Yeats' library has been cataloged from the short-title list here.